Roosevelt Islander Online: Giant RI Monument Mock Up Displayed For Comments At Tram Station Plaza Last Saturday - What Do You Think? Giant RI Monument Mock Up Displayed For Comments At Tram Station Plaza Last Saturday - What Do You Think? 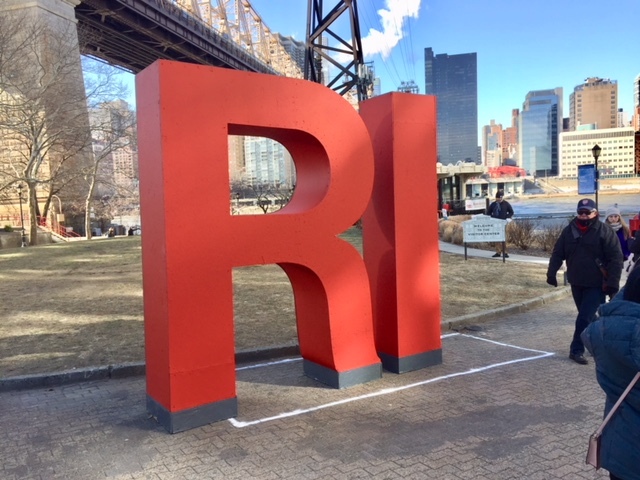 Riverwalk Developer and Main Street Retail Master Leaseholder Hudson Related's proposed Giant RI Monument sign mock up was back for a second display at the Tram Plaza Station last Saturday afternoon for viewing by Roosevelt Island residents and tourists. Roosevelt Island Operating Corp (RIOC) Public Information Officer Alonza Robertson explains that RIOC was seeking comments from passerbys on the RI Giant Monument and you can still give your opinion online. The weather was very cold so most people I observed walked past the Giant RI monument without stopping. Some noticed it and took pictures. Based on my very small sample over a little more than an hour, tourists liked the Giant RI monument and residents were split. Two residents liked it and 4 did not. The Giant RI Monument mock up was displayed for about 4 hours. A visitor from the Netherlands told me she loved the Giant RI monument and said tourists would certainly want to take pictures of it and selfies. As we continued talking, she said if she was a resident of Roosevelt Island, she would hate it adding that there is a similar type monument in Amsterdam that tourists love but residents hate. The structure interferes with the panoramic view of the tram, the lawn, the landmark quality Visitor Center Kiosk and the city beyond. The structure serves no purpose other that to have 10 feet tall letters. The structure is a tempting object for kids to climb on. 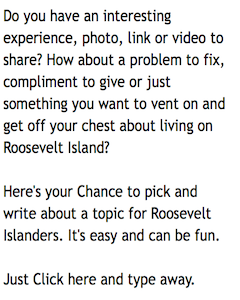 Roosevelt Island is a community not an amusement park attraction. People are already on Roosevelt Island: RIHS sees no reason to shout; people know they are here. Roosevelt Island’s “R.I.” sculpture is a delight, and I hope it becomes a permanent installation. 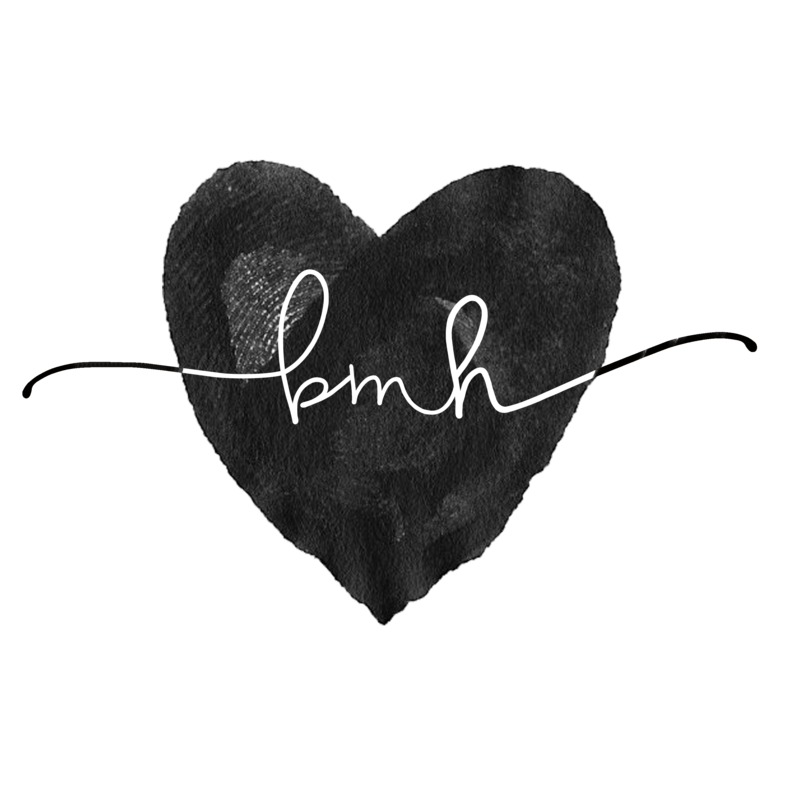 Unnecessary. Blocks the view of the kiosk and the river. Someone has a 10-foot ego. RIOC insufficiently promotes our Island as a tourist destination. When visitors arrived in the recent past, they had no way of knowing there are eight restaurants, an art gallery and spectacular views of the Manhattan skyline. No wonder they immediately re-boarded the tram. 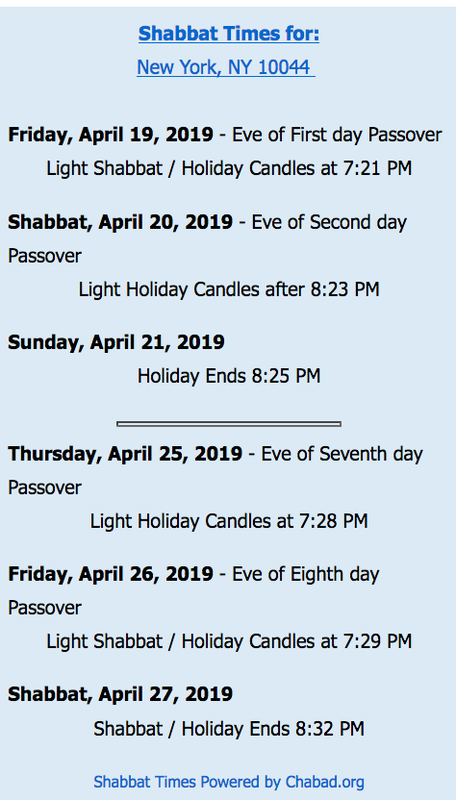 RIOC has yet to print rack cards (a standard promotional item) and distribute them to the tourist information carts parked in heavily trafficked locations, in addition to the new and inaccurate brochure supplied to the NYC Visitor Center on Seventh Avenue. Erica Spencer-EL said the brochures are now available at the tram stations. Brochures at the tram station are a positive step, but by then it is almost too late. RIOC has to connect with visitors BEFORE they get on the tram to spark an interest in taking the tram in the first place. If you build an RI sign, visitors won't come unless you promote it. I anticipate that tourists may stumble upon the RI sign when they arrive, take a photo and get back on the tram, as in the past, without spending a dime here. People may talk about the Robert Indiana LOVE sculpture on Sixth Avenue and West 55. How many have seen the HOPE sculpture by the same artist at SeventhAvenue and West 53, only a few blocks away? All in all, I do not see the sign as a positive for the Island. The money invested in this project would be better spent on promotion of the Island as a tourist destination, and then on signage when people arrive here. The RIOC Real Estate Advisory Committee will make final decision on whether Giant RI Monument is installed at Tram Plaza station or not.